We may love coffee, but we don't stop there. Shop our fully stocked tea selection. The most oxidized of all teas, black tea boasts the strongest flavor and highest caffeine content of any of the teas brewed from the Camellia sinensis plant. Dating back to the earliest times of tea processing in China, black tea initially was made into a brick shape (pu’erh tea) which made it easier to put in a pack and take on long trips by horse along the tea horse road of China. Dutch merchants who began trade with China in the early 1600’s brought the beverage back to Europe and the Westerner's love of black tea began! To get the maximum antioxidant benefits from your black tea, brew at a near boiling temperature. Black tea is delicious by itself or with cream and sugar. Because it does not undergo the same withering and oxidation processes utilized in the production of black and oolong teas, green tea contains the highest Catechin content, a cell-damage preventing antioxidant. Green tea is carefully picked and then quickly pan-fired or steamed in order to prevent further oxidation which would turn the leaves brown. Chinese green teas are usually pan fired, causing a toasty character to sometimes be in the cup. Japanese green teas are usually steamed, which preserves the tea's vibrant green color. To maintain the sweet, light, vegetal flavor of the tea and to prevent bitterness, steep your tea under 3 minutes and below boiling temperature. White tea is made from the youngest, most delicate leaf tips and buds of the tea plant. Unlike black or green tea, it is not oxidized, steamed, or pan-fired. This minimally touched tea has a fresh, delicate flavor and the color in the cup is a snow/silver color from which white tea gets its name. This can be a very expensive tea due to the detailed laborious nature of the picking process. White tea is high in antioxidants and is known to have cooling properties which makes it a nice beverage iced on a hot day. Like green tea, avoid steeping your tea in boiling water and for longer than three minutes to avoid ruining the delicate flavor. Oolong tea is a partially-oxidized tea, often withered under strong sunlight before it is twisted and curled. The flavor of this traditional Chinese tea varies greatly depending on variety and oxidation time - sometimes more closely resembling the flavor of green teas, and sometimes that of black. The caffeine content generally falls somewhere between that of green and black tea, depending on the oxidation time. Like other varieties of the Camellia sinensis, oolong provides many health benefits and contains a high antioxidant content. Native to South America, this caffeinated plant of the holly family is consumed widely throughout Uruguay, Argentina, and Brazil, and traditionally drunk socially from a hollowed calabash gourd. Mate is praised for it's gentle stimulating properties, it's high concentration of various vitamins and minerals, and for containing antioxidants known as polyphenols. The flavor is often described as grassy and similar to some green tea varieties, and is delicious hot or iced, sweetened or unsweetened. 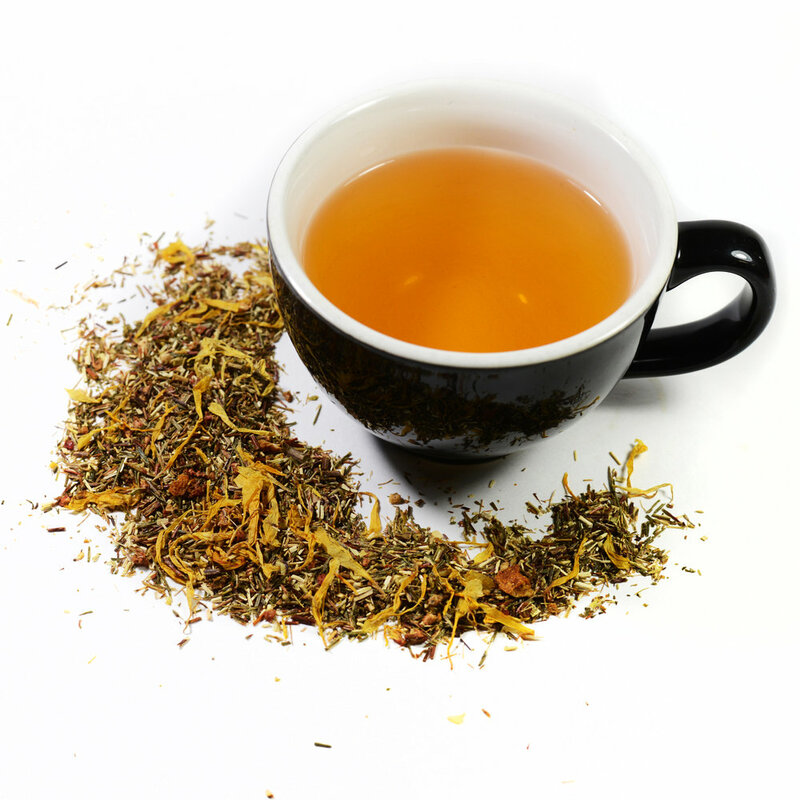 Herbal teas are made from a plethora of different ingredients including herbs, spices, flowers, and fruits. They may contain any number of consumable plant-based materials, expect for that of the Camellia sinensis. They are free of caffeine and may steeped at boiling temperatures for an indefinite period of time. They may sweet and delicate, rich and earthy, zesty and fruity, and can be enjoyed hot or iced. This traditional African herbal tea is made from the needle-like leaves of the Aspalathus linearis plant, and is also known as redbush tea. While it does not contain caffeine as non-herbal teas do, it does share some of the same health benefits, including a high antioxidant content and immune-boosting properties. Rooibos is often prepared in the same manner as black tea, and recently, occasionally in the same manner as espresso - concentrated, and sometimes with steamed milk to mimic a latte or cappuccino.